Geomatics division to form a core multi-disciplinary group dedicated to Remote Sensing, GIS, GPS, Digital photogrammetry, LiDAR , Terrestrial and mine survey for integrated natural resources survey and management. Geomatics division has a professional group of multidisciplinary team having rich experience in the field of airborne and satellite data processing, GIS, Surveying, photogrammety, geology, civil engineering, computer science and digital image processing. CMPDI has established a full-fledged Geomatics division to form a core multi-disciplinary group dedicated to Remote Sensing, GIS, GPS, Digital photogrammetry, LiDAR, Terrestrial and Mine Survey for integrated natural resources survey and management. Geomatics division has a professional group of multidisciplinary team having rich experience in the field of airborne and satellite data processing, GIS, Surveying, Photogrammetry, Geology, civil engineering, Computer Science and Digital Image Processing. Considering the best application of geospatial technology in mining sector, Coal India/CMPDI has been conferred Geospatial World Excellence Award- 2012 at Amsterdam, The Netherlands for Application of Geospatial Technology in Mining. 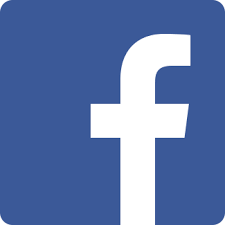 Data Conversion: Large format Scanner Digitizer, CADD softwares & Raster to Vector Conversion Software. CMPDI offers its Geomatics services in all the three stages of mining t.e. pre-mining, syn-mining and post-mining ranging from topographical survey, mineral exploration, environmental management planning to excavation measurement, land reclamation monitoring, erosion and siltation, coal mine fire and land subsidence measurement. Regional geological and structural mapping are carried out for locating the potential coal/mineral bearing zone using hyper spectral satellite data for detail exploration planning. Land use/vegetation cover mapping of coalfields are carried out for creating geo environmental database and to assess impact of mining and associated industrialization on land environment by analyzing temporal satellite data. 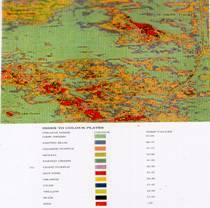 Land use/vegetation cover mapping of Singrauli coalfield based on satellite data. Satellite surveillance for land reclamation of all the OC mines of CIL are carried out on annual basis for assessing the progressive status of mine land reclamation and for taking up remedial measures, if any, required for environmental protection. Water resource survey and hydrological study. Data from space platforms play a significant role in reservoir capacity estimation surveys. In the recent past, Satellite Remote Sensing has emerged as an important tool in carrying out reservoir capacity surveys rapidly, frequently and economically. CMPDI did the sedimentation assessment in Govind Ballabh Pant Sagar near Singrauli Coalfield at different periods. Methodology for mapping coal mine fire using Airborne Thermal Scanner (Daedalus-1268) data was first developed by CMPDI in collaboration with NRSC, Hyderabad way back in the year 1992 in India. Coal mine fire mapping is being carried out using ASTER thermal band data for Jharia, Raniganj , Bokaro and Karanpura coalfields on annual basis and Fire Management Information System (FMIS)is developed to monitor the fire dynamics. About 2.04 million hectare land of the country is affected by soil salinity/ alkalinity. Due to excess use of chemical fertilser and canal irrigation, soil salts precipitated at the surface and made the land barren. CMPDI has developed the methodology for cadastral level sodic land mapping based on high resolution satellite data for UP Bhumi Sudhar Nigam Ltd. Sodic land mapping in Pratapgarh and Allahabad districts was carried out as pilot project for UPBSNL. Cadastral level sodic land map of Rendigarpur village, Pratapgarh District. -Land use/cover pattern in core and buffer zone based on satellite data for EMP of mining projects . CMPDI has established a methodology for locating the potential TPS sites numero uno using Geo Spatial technology in India for Central Electricity Authority, Govt. of India. More than 100 TPS & UMMPs sites are located by CMPDI including pit heads, load centers and coastal areas. Most of the UMMPs are coming on the sites selected by CMPDI. Preparation of updated topographical maps of major Indian Coalfields on 1: 5000 scale on 2m.contour interval based on Remote sensing Technique in collaboration with Survey of India. Siltation Study in GBP Sagar based on satellite data. Monitoring of coal mine fires in Jharia, Raniganj, Bokaro and Karanpura coalfields based on ASTER satellite data and development of Mine Fire Information System (MFIS). Site selection for Thermal Power Station in state of Uttar Pradesh, Coastal area of Karnataka and Punjab base on remote sensing and GIS for Central electricity Authority (CEA). 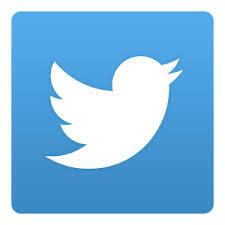 Following is the list of some key projects executed by Geomatics Division in recent past. Topographical Survey of ISM, Dhanbad campus on 1:500 scale with 0.30m.contour interval using ETS. Topographical survey of lease area of Ultratech Cement in Pali, Rajsthan on 1:2000 sacle with 1m. contour interval using ETS and Laser scanner for Aditya Birla Group. Correlation survey in U/G mines of Bharat Coking Coal Ltd.
Control point establishment with National grid in Rajmahal coalfield using GPS for Eastern Coalfields Ltd.
Airborne Remote Sensing for coastal land use Mapping: Calngute -Candolim beach, Goa. Geo-Environmental study of Karanpura Coalfield. Comprehensive Remote Sensing study for creating Environmental database of Moher sub-basin, Singrauli Coalfield. Thematic Mapping for creating Environmental database of Korba Coalfield through Remote Sensing. 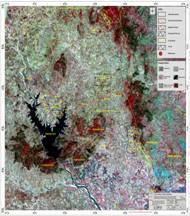 LandUse/Cover Mapping of Mchuchuma-Katewaka Coalfield, through Remote Sensing. Digital database creation of South Karanpura Coalfield. High-resolution Thematic Mapping of Moher sub-basin, Singrauli Coalfield using airborne scanner data. Geospatial Environmental Management Planning of Udaipur and Chittorgarh Districts of Rajsthan. Geostructural Mapping of Talcher Coalfield using Remote Sensing data. Geostructural Mapping of Chindipara, Alaknanda and Mandakini Blocks, Talcher Coalfield. Structural analysis of Mandu Block, West Bokaro Coalfield, based on Satellite Data. Geostructural Mapping of Badamgarh Pahar, Orissa. Geostructural Mapping of Mchuchuma-Katewaka Coalfield, through Remote Sensing. Geomorphological & Geostructural Mapping of N. Karanpura, S. Karanpura, Sonhat, Pench Kanhan, Wardha Valley, Manargudi & Neyveli CBM Blocks. Study of Environmental problems of Aravali hill region in Alwar Distt. of Rajsthan and Gurgaon Distt. of Haryana and preparation of action plan for restoration of Environmental quality. Integrated spatial Environmental Management planning of Korba region. Integrated spatial Environmental Management planning of Satna Limestone belt. Geostructural Mapping for tunnel alignment in Kemming, Assam based on high resolution Satellite Data. Land degradation assessment in part of Wardha Valley Coalfield. Land Use/Cover Mapping of East Bokaro Coalfield, based on Satellite Data. Land Use/Cover Mapping around proposed railway siding between McLuskiganj and Piparwar. Land Use /Cover Mapping of Jamuna - Kotma Area, Sohagpur Coalfield, through Remote Sensing. Land Use/Cover Mapping of Tacher Coalfield based on Satellite Data of the year-1986, 1992 and 1998. Land Use/Cover Mapping on 1:10.000 scale, of Korba Coalfield based on IRS-IC/PAN and data of the year 1998. 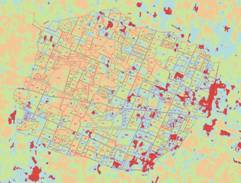 Land Use/Cover Mapping of East –Bokaro Coalfield based on Remote Sensing data. Land Use/Cover Mapping of Ib Valley Coalfield based on Satellite Data of the year-1989, 1994 and 1999. 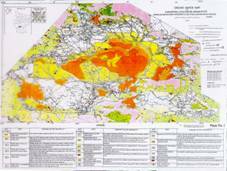 Land Use/Cover Mapping of Mand-Raigarh Coalfield based on Satellite Data of the year 1988 and 1998. Land Use/Cover Mapping of Buffer Zone of Orient group of mines. Land Use/Cover Mapping of Buffer Zone of 10km. Radius of Natraj U/G project. Preparation of Land Use/Cover map of Buffer Zone of 10km. Radius of Bhotang and Dikchu copper mine, Sikkim. Land Use/Cover Mapping of Buffer Zone of Hirabuddin Gold Mine, Karnataka. Land Use/Cover Mapping of Lease Hold Area of Bhubaneswari OCP based on High Resolution Satellite Data. Large Scale Land Use/Cover Mapping of Dhorwasa, Kolagaon, Durgapur, Padampur, Lalpeth OCPs. Land Use/Cover Mapping of Singrauli Coalfield based on Satellite Data of 2001 for REMP. Land Use/Cover, drainage Mapping of Buffer Zone of 10km. Radius of Rajrappa OCP-II, Tarmi OCP and Govindpur OCP. Land Use/Cover, drainage Mapping of Buffer Zone of 10km. Radius of Rajmahal project. Land Use/Cover & Hydrogeomorphic Mapping of Manatu, Koyad and Kishanpur Blocks, North Karanpura Coalfield through Remote Sensing. Land Use/Cover & Hydrogeomorphic Mapping of Ashok, Piparwar and Mangardaha Blocks, North Karanpura Coalfield, through Remote Sensing. Railway Route alignment for extension of Railway Siding up to Baraod-Bijari Block, Mand Raigarh CF. Land Use/Cover Mapping of Singrauli Coalfield and Siltation study in GBP Sagar based on Satellite Data of the year 1998. Site selection for pit head coal based TPS in 8 Coalfields and gas based TPS in vicinity of Delhi. Cadastral level Sodic land Mapping of Rendigarpur, Govindpur, and Newada villages in Pratapgarh distt of U.P. Sodic land Mapping of Allahabad Distt.,U.P.